Rice Lake RoughDeck PW-1 pallet scale is an economical alternative to a floor scale in manufacturing and warehouse environments. The u-shape of the pallet scale is designed to decrease cycle time when weighing pallets, skids and totes. We've seen a few of these types of scales in the past and often they are made with inexpensive components and simply not built to last. 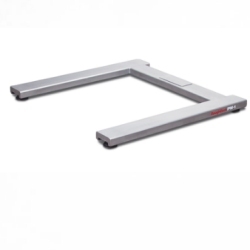 Fortunately, Rice Lake has come along to build a reliable version of this low profile pallet weighing floor scale that you can have confidence in using. Rice Lake Weighing System RoughDeck PW-1 pallet scale is an economical alternative to a floor scale in manufacturing and warehouse environments. The u-shape of the pallet scale is designed to decrease cycle time when weighing pallets, skids and totes by eliminating the need to remove the pallet jack from a traditional floor scale. Available in both mild and stainless steel, the PW-1 pallet scale comes in a variety of sizes and capacities, as well as with an optional wheel kit for easy portability. A low-profile design ensures a wider variety of pallets, skids and totes can be weighed on the scale. No ramps or pits makes for a fast and simple installation, and a top-access junction box provides easy service and troubleshooting access. Available in painted steel or stainless steel.